SAMBAH was presented together with the BIAS project (www.bias-project.eu) under theme 3. In the discussions, SAMBAH was often used as a good example of an international project addressing a migrating population within most of its distribution range and using a variety of actions to reach stakeholders at various levels. Further information about the meeting is available here. SAMBAH organizes an internal progress meeting on March 22, 2015, in conjunction with the 29th Annual European Cetacean Society conference in St. Julian’s, Malta (www.europeancetaceansociety.eu). Several SAMBAH presentations will also be given at the conference. SAMBAH will be presented in March 2015 at the 43rd symposium of the European Association for Aquatic Mammals, (www.EAAM.org) hosted by Kolmården Wildlife Park, Sweden. Hel Marine Station, Gdansk University, and WWF Poland organized a harbour porpoise workshop in Warsaw in December 2014. The aim was to highlight the dire situation of the Baltic harbour porpoise in general and of the Polish population in particular. The discussions were based on the recent SAMBAH results, that were presented by SAMBAH representatives. The target attendees represented administrative authorities - Ministry of Environment, General Directorate of Environmental Protection and other governmental institutions connected with harbour porpoise conservation and species management. Also invited were fisheries stake holders and NGOs. The SAMBAH EoPC was hosted in December 2014 by the Kolmården Wildlife Park, Sweden. Please refer to the “Conferences” tab for more information. 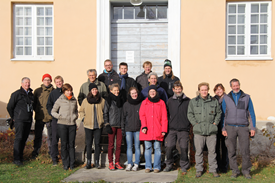 The Swedish Agency for Marine and Water Management organized a porpoise workshop in December 2014 in Kolmården, Sweden. It was targeted on management authorities, stakeholders and users of the marine environment. The aim was to discuss how the SAMBAH results can be used to ensure the conservation of the harbour porpoise in Swedish waters. In August 2014 the brig Tre Kronor (Three Crowns; www.briggentrekronor.se), a two-masted square sail ship, arranged a two-day harbour porpoise safari event in the Öresund area, in Southern Sweden. The ship departed from Helsingborg and sailed northward to the Kullaberg nature reserve. On board Swedish and Polish SAMBAH representatives presented SAMBAH and acted as guides. The weather was perfect and the participants got to see many porpoises, including mother and calf pairs. They could also hear their sonar click sounds via a click detector. The Polish SAMBAH team rigged a towed hydrophone array system, which tracks and identifies porpoises based on their echolocation sounds. It demonstrated that more porpoises were in the area in addition to those visually spotted. SAMBAH arranged a progress meeting at the European Cetacean Society annnual conference in Liége, Belgium 2014. SAMBAH has requested to extend the project time until 30th of September 2015 and the European Commision has granted the request. The extra time will afford us to focus more on data analysis during 2014 and on administration in 2015. SAMBAH was presented at the 20th Biennial Confereonce on Marine Mammals, Otago University, Dunedin, New Zealand, 9-13 December by Julia Carlström of Aquabiota Water Research. On the StUK conference in Berlin, Germany Jens Koblitz of the German Oceanographic Museum also presented SAMBAH. The finnish SAMBAH crew have hosted a progress meeting for all SAMBAH participants in Seili, Finland. Although finalization of the data collection took longer than expected, the density estimates are still going to be calculated in the spring of 2014 and presented at the annual European Cetacean Society Conference in Liége, Belgium 2014. 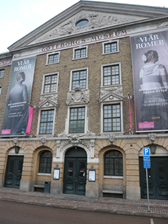 The German Oceanographic Museum led an array study during 2012 in Wales and during 2013 in Kerteminde, Denmark. The aim of the study was to evaluate different Passive Acoustic Monitoring instruments and to be able to track porpoises accurately underwater. This in turn gives us data to calculate the detection function for the different instruments. This is a key piece of information, describing the probability of porpoise detection at a given distance from the instrument and will be a factor in our subsequent modelling. For more information on COSAMM, click here. 1 May 2013. 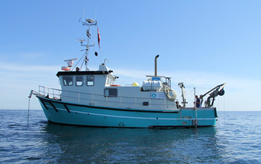 SAMBAH has now finished collecting all data from the Baltic Sea. 2 years of exciting field work has come to a conclusion, and we are now focusing on analyzing the massive amount of data gathered. We are expecting that gear that have had their surface markers destroyed by ship collisions and trawling activity will resurface to some extent and we will continue to incorporate data until the end of 2013. Kolmården are proud to welcome the European Commission on a visit on the 13th and 14th of June. Among other things they will accompany Kolmården to serve a coastal position. On 15 april 2013 we hosted a SAMBAH stakeholder workshop to discuss possibilities based on future results from the SAMBAH project. On 7 april 2013 SAMBAH held a progress meeting in conjunction with the annual ECS (European Cetacean Society) conference in Setubal, Portugal. All nations in the project participated bar Lithuania and Latvia. We also had scientists from France and the US who were interested in the methodology being developed in SAMBAH participating in the meeting. Overall a lot of focus was given to the retrieval of C-PODs, data entry and data analyses. "A sailing summer for the harbour porpoise"
http://www.ein-tierischer-segelsommer.de (german only) English presentation (pdf) available here. 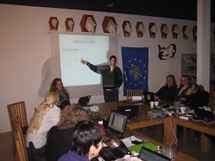 26-28 March 2012 - SAMBAH held a progress meeting in conjunction with the annual ECS (European Cetacean Society) conference in Galway, Ireland. All nations in the project participated bar Lithuania and Latvia. We also had scientists from France who were interested in the methodology being developed in SAMBAH participating in the meeting. Overall a lot of focus was given to practical issues in the field and discussions on how to best deal with them. We also planned for the analysis which is due to begin as soon as the field period is over. 28-30 October 2011 a progress meeting was held in Kerteminde, Denmark. In conjunction with this meeting several working groups also met to discuss different topics. 20 March 2011 - A spring progress meeting was held in Cadiz, Spain, in connection with the 25th ECS conference. 23-24 November 2010 - A SAMBAH fall progress meeting was held at Kolmården Wildlife Park with participants from Sweden, Denmark, Germany, Poland, Lithuania, Latvia, Estonia, Finland and France. Prominent in the agenda were the national updates, where national representatives presented the progress of SAMBAH in their respective country. In general, we are making great progress. Most permits for deployment are ready or will be very soon, and most equipment is ready. Due to ice in the northernmost countries however, the date for deployment of the C-PODS was moved back from January to May 2011. There were discussions on statistical methods and the anchoring set ups in all countries, and we will be continuing both of these discussions until the deployment of C-PODs. Also, a project dissemination working group was formed. This group will be producing the SAMBAH exhibition which will be showed at serveral locations in the project area. Five different systems were tested and evaluated at sea during a whole day session at Nävekvarn, just outside of Kolmården at depths around 40 m. The systems were of two types, stealth systems with no surface markings and systems attached to visible surface markings. All systems were successfully tested and evaluated with mixed results. ​The systems had been individually developed by each research group and based on different coastal and off-shore prerequisites for each country, maintenance issues, earlier used setups, rules and regulations for sea surface markings and of course budget. Other issues as the hazards with buoys or equipment near/or in trawling areas, different weather conditions, material corrosion & fatigue and also the risk of potential theft and vandalism were discussed. Altogether the workshop was a success with valuable discussions and practical experience of deploying and retrieving porpoise detectors. 17-18 May 2010 - A sea security course was arranged for sea-going SAMBAH personnel. 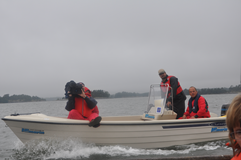 The course was given by the Öckerö Maritime Center on the Swedish west coast, with participants from Denmark, Finland and Sweden. The course included emergency radio communication, emergency flares, first aid, ship fire extinguishing, and in-sea testing of life rafts and survival suits. The course was aimed at preparing the teams for work on board a variety of vessels, such as coast guard ships, fishing boats and research vessels. Among the teachers were a professional fireman, and an ambulance nurse, ensuring that the quality of the teaching was very high. 12 May 2010 - Mats Amundin and Daniel Wennerberg were invited to attend a Baltic Sea Regional Advisory Council (www.BSRAC.org) meeting in Klaipeda, Lithuania, and to present the SAMBAH project. Very reassuringly, SAMBAH was very positively received. The BS RAC is established by the European Council to increase stakeholder involvement in the development of a successful Common Fisheries Policy. Hence it is a very good forum for SAMBAH to establish and maintain contact with the fishermen, the support of whom is vitally important for the success of SAMBAH. 4 May 2010 - SAMBAH information material are available for download. Please click here for an information sheet or an introductory presentation. 20-24 March 2010 - The SAMBAH kick-off meeting was held in conjunction with the Jastarnia group meeting in February 2010 in Hel, Poland. 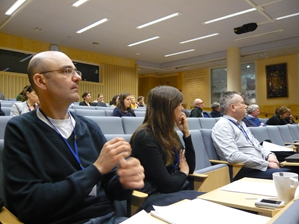 At the ECS conference in March in Stralsund, Germany, SAMBAH arranged an open workshop and a project progress meeting. January 2010 - SAMBAH is now up and running! The project is funded by LIFE+, and will receive 50% of the 4.24 million € budget from LIFE+. The remaining 50% will be co-financed by project partners and other national organizations.